Findagrave.com, memorial #26920725. Photo by BobBoston. [S185] Concord, Massachusetts Births, Marriages, and Deaths, 1635–1850, 16, Samuel Brooks b. [S368] Vital Records of Medford, Massachusetts, To the Year 1850, 348, Samu[e]ll Brooks d.
[S83] Bond, Watertown Genealogies, 2:723–24. [S572] William Gray Brooks, 65. [S368] Medford VR, 348, Sarah Brooks d.
[S148] FindAGrave.com, memorials #26920725, #26920726. [S36] James Savage, A Genealogical Dictionary, 1:262. [S318] Thomas Bellows Wyman, Charlestown Estates, 1:133. [S368] Medford VR, 32, Sarah Brooks b. His wife was the 2nd great grand-aunt of President James A. Garfield, making their children 1st cousins three times removed of the President. [S185] Concord, Massachusetts Births, Marriages, and Deaths, 1635–1850, 39, Samuel Brookes b. [S1495] Daniel Brooks probate file. [S312] Mary Frances Peirce, Town of Weston. 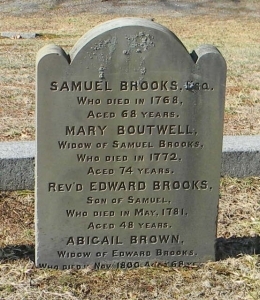 Births, Deaths and Marriages 1707–1850, 54, Samuel Brooks/Elisabeth Gearfield m.
[S185] Concord BMD, 195, Samuel Brooks d.
[S185] Concord BMD, 245, Elizabath Brooks d.
[S2363] Concord Gravemarker Data, OHBG-371, Mr. Samuel Brooks; OHBG-372, Mrs. Elizabeth Brooks. [S2363] Concord Gravemarker Data, OHBG-371, Mr. Samuel Brooks. [S185] Concord BMD, 149, Samuel Brooks b. [S185] Concord BMD, 151, Elisabeth Brooks b. [S185] Concord BMD, 155, Enoch Brooks b. [S185] Concord BMD, 157, Mary Brooks b. [S185] Concord BMD, 167, Elisha Brooks b. [S185] Concord BMD, 173, Anna Brooks b. [S185] Concord BMD, 180, Sarah Brooks b. [S185] Concord BMD, 190, Marcy Brooks b. [S368] Vital Records of Medford, Massachusetts, To the Year 1850, 32, Samewell Brooks b. [S361] Vital Records of Waltham, Massachusetts, To the year 1850, 123, Samuel Brooks/Abigail Hastings m.
[S368] Medford VR, 194, Samuel Brooks/Abigail Hastings m. Waltham. [S522] Samuel Sewall, The History of Woburn, 1:134-6. 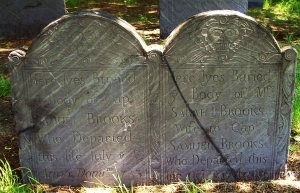 [S368] Medford VR, 348, Samuel Brooks Jr. d.
[S318] Thomas Bellows Wyman, Charlestown Estates, 1:133, Samuel (7.) Brooks Jr.
[S572] William Gray Brooks, 74. [S368] Medford VR, 29, Abigail Brooks b; 346, d.
[S368] Medford VR, 29, Abigail Brooks b. [S368] Medford VR, 29, Anna Brooks b. [S368] Medford VR, 31, Mary Brooks b.; 348, d.
[S368] Medford VR, 32, Samuel Brooks b. [S368] Medford VR, 32, Thomas Brooks b. [S368] Medford VR, 29, Abijah Brooks b. [S368] Medford VR, 32, Philemon Brooks b.
Descendants of Samuel/4a Brooks Jr.
Findagrave.com, memorial #30266525. Modern gravestone, Oak Grove Cemetery. Photo by BobBoston. [S305] Thomas W. Baldwin, Vital Records of Reading, Massachusetts, To the year 1850, 31, Mary Bouttall b. [S51] James Emery Brooks, My Great Grandfather's House, 50, 64: "who brought with her …." [S305] Reading VR, 293, Samuel Brooks/Mary Boutwell m.
[S409] Thomas W. Baldwin, Vital Records of Wakefield, Massachusetts to the Year 1850 (Boston: 1912), 165, Samuell Brooks/Mary Boutell m. (c.r.). [S83] Henry Bond, Watertown Genealogies, 2:724, 725. [S368] Vital Records of Medford, Massachusetts, To the Year 1850, 348, Samuel Brooks Esq. d.
[S53] Gravestone, recorded 27 Jul 1996: 1772. [S53] Gravestone, recorded 27 Jul 1996. [S305] Reading VR, 36, Mary Brooks b.; 500, d.
[S305] Reading VR, 36, Sarah Brooks b.; 500, d.
[S368] Medford VR, 31, Mary Brooks b. [S368] Medford VR, 32, Samuell Brooks b. [S368] Medford VR, 30, Edward Brooks b. [S368] Medford VR, 31, Jonathan Brooks b.